Babblings of a Mommy: Designer Inspired Bags...to buy or not to buy? Designer Inspired Bags...to buy or not to buy? 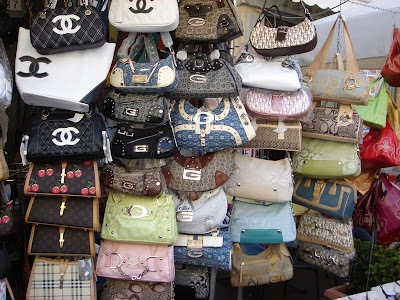 Buying Designer handbags or "knock offs" as some people like to call it is a touchy thing. Some people snicker at the thought of buying anything but authentic, while others have no problem with it at all. Knock offs have such a bad stigma but Shop Suey Boutique has been featured on People Style Watch, Glamour, Cosmo, InStyle, Life & Style, and Redbook...So hey, if these major publications have no problem featuring them in their designer filled pages then I see no problem with it...do you? Designer inspired bags for me are okay as long as they do not copy the entire name and style of a certain designer bag. And these times are getting harder so we may preferably in style even o a tight budget. Actually,I've been searching for sites that has designer-inspired bags through search engine optimization (Orange County area) until I find out this blog of yours. This post made me know where I must go to for great bags in cheaper prices. SEO orange county is indeed a very powerful tool in getting my sites found and be known. My girlfriend is such a fan of designer-inspired bags. But when a friend of hers showed her an online shopping site for authentic designer purses and bags, she tried it for herself and she got hooked into it. I've also bought some designer purses from Canada for our anniversary. Hope she'll love it!